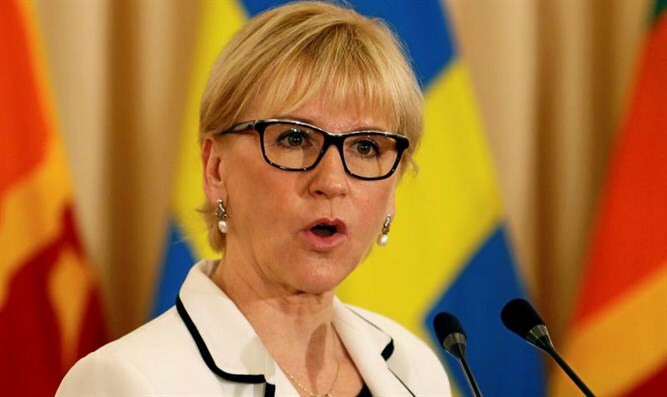 Sweden’s foreign minister told Palestinian Arabs that her country will “fight with you and for you,” prompting pro-Israel activists to accuse her of encouraging violence against Israelis. Margot Wallstrom, whom Israel has accused of pursuing hostile policies against the Jewish state, made the pledge last month during a visit to an exhibition at the Palestinian Authority representative’s office in Stockholm. Sweden is the only country in the European Union that recognizes a state it calls Palestine. “Palestinians walk around with keys in their pockets to homes that they once owned,” she said in reference to the Palestinian Arabs’ aspiration for what they call “return” to places inside Israel that some 700,000 Arabs left during the 1947-48 war that led to Israel’s creation. In 2015, Wallstrom said that terrorist attacks in Paris by radical Islamists were rooted in the Arab-Israeli conflict, drawing protests from Israel.